Essential tool to make watercolour painting easy. 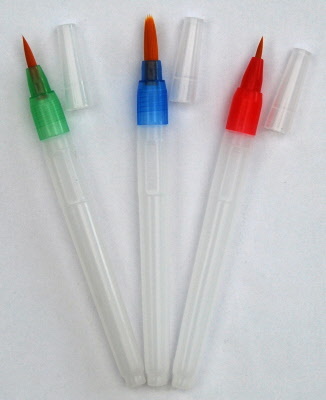 These brushes are ideal for filling in stamp designs or for general painting. Each brush has a reservoir barrel to hold water. Value pack of 3 colour coded brushes - small, medium and large. The brush head is made of soft white synthetic taklon.